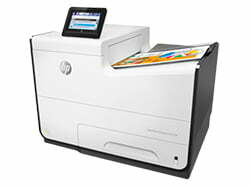 HP has reinvented the way we print, by introducing the industry changing HP PageWide. These unique printers provide: fast, high quality, low cost, reliable printing. HP PageWide devices have a stationary ‘page wide’ print head, which prints using 42,240 tiny nozzles, ejecting ink precisely on a moving sheet of paper. 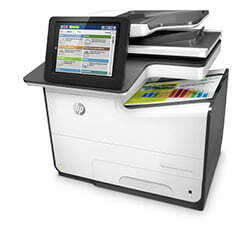 Reliability is a significant advantage of the HP PageWide printers. Research conducted by Buyers Lab (BLI) showed that the A4 HP PageWide device printed 200,000 pages without a failure, misfeed or paper jam, meaning you can be confident that any long print runs will go, without disruption. Not only are the HP PageWide printers faster, cheaper, and better quality, they are proven more reliable and more secure. With a real emphasis on security, HP’s Security Managed Print Services helps customers to secure their print environment, with the industry’s strongest protection. The HP PageWide printers can detect a threat, act against it, and protect it from future attacks; meaning you can be sure to be protected from any malicious threats. Midshire is one of only a small number of suppliers in the UK to have access to the PageWide range, including the: HP PageWide 556dn printer, HP PageWide 586dn MFP and the HP PageWide 586z MFP. 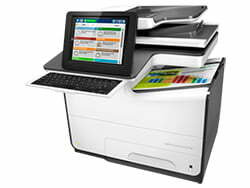 The most basic printer in the HP PageWide Enterprise range, the PageWide 556dn offers just print functionality, but this is not a basic printer. With print speeds of over 75ppm in colour and black and white, you can get the documents you need, at rapid speed. As with the entire HP PageWide range, the 556dn offers un-paralleled security and management, protecting it from security threats from start-up to shut-down, so you don’t have to worry about confidential data getting into the wrong hands. The HP PageWide Enterprise Colour MFP 586dn offers ultimate value for money, delivering rapid print speeds and incredibly security features for the lowest total cost of ownership in its class. This expandable desktop printer is ideal for teams of 5-15 people printing 2,000 to 7,500 pages per month, who want a fast, reliable printer to depend on during the busiest periods. HP PageWide technology delivers reliable performance designed to keep productivity high, without compromising on energy efficiency. The 586dn is designed to use less energy that a standard laser printer, making it a wise choice for any modern office that cares about costs and green issues. The HP PageWide Enterprise Colour Flow MFP 586Z is three times as impressive, combining the fastest speeds, tightest security with the lowest cost of ownership in its class. Ideal for medium sized work groups of 5 to 15 users, printing up to 7,500 sheets per month, the HP PageWide 586z increases productivity, without compromising on colour quality. Gain peace of mind, with embedded security settings that both detect and resolve security threats. Additionally, give workgroups the apps they need, with over 175 HP and 3rd party solutions. The HP PageWide 586z offers same features as the HP PageWide 586dn, with the addition of a pull-out keyboard for easy data input, giving you additional flexibility, meaning you can be even more productive. HP PageWide printers can be placed on a Midshire Managed Print Service, which includes the general maintenance, ordering and delivery of ink, preventative maintenance, emergency and routine engineer visits and providing us with meter readings using our machine monitoring software, OneStop. With a Midshire Managed Print Service you don’t have to worry about anything to do with your printer, meaning you can get on with what you do best.